Characters from the real and fictional worlds cross paths in the New York Times bestselling Story Thieves series—now available as a collectible paperback boxed set! But everything changes the day Owen sees the impossible happen—his classmate Bethany climbs out of a book in the library. It turns out Bethany’s half-fictional so she can jump into any book she wants. AND she can take anyone with her! Including Owen!!! Jump into this action-packed adventure with the first three books in the series! 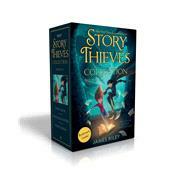 This boxed set includes paperback editions of Story Thieves, Stolen Chapters, and Secret Origins.